Online swapping is nothing new (http://usatoday30.usatoday.com/money/perfi/tips/2010-12-18-toys-swap_N.htm), but what are some sites that can be used to find what one is looking for? If you have electronics that you do not use any longer, you can try Trade2Save, "a used electronics marketplace where you can get paid for your old gadgets. [Trade2Save makes] it easy to resell all those used electronics and media. Cell phones, PDA's, MP3 player, GPS units, laptops, gaming consoles, video games, and dvd's--if it works, it can be bought and reused and you get paid to be responsible." On their website they "promise you the best trade-in price plus you get a 4% bonus in Green Points for being green," so maybe it is worth checking it out. And when your child outgrows clothing, simply fill up a thredUP bag and put it on your doorstep. thredUP covers the shipping, and pays you for every item we can hand down to other moms. Those two sites are for selling second-hand items. If you are looking for a real swap, SwapMammas is the place to go for kid items. "Swapmamas is free to all. No middleman. No warehouse. No fees. You choose what you want to swap, who you want to swap with, and how you want to ship. The only thing you pay is the cost to ship your package to a friend. (And if that's not an option for you, join a local group and bypass shipping all together!)" There is no selling or buying, just swapping. They are also on Facebook (https://www.facebook.com/SwapMamas). On Facebook you may be able to find other alternatives more local to you, like the Space Coast Mom's Swap, Shop & Talk for Brevard County residents. It currently has over 1,500 members and a separate group for swapping clothing, shoes and costumes. Another group on Facebook that actually meets once a month to swap stuff is The Really Really Free Market (RRFM) of Melbourne/Palm Bay, Florida. It has 350 members now that are invited to meet from 1 to 3 pm on the last Sunday of each month at Holmes Park, 914 Melbourne Avenue, Melbourne. (Often called Manatee Park). Freecycle.org is also an alternative to look for and offer items. On their site you can find a location near you, become a member, and get started. "The Freecycle Network™ is made up of 5,082 groups with 9,250,984 members around the world. It's a grassroots and entirely nonprofit movement of people who are giving (and getting) stuff for free in their own towns. It's all about reuse and keeping good stuff out of landfills. Each local group is moderated by local volunteers (them's good people). Membership is free." If you are interested in donating to schools and teachers' projects, you can use Donors Choose to see what projects are listed and towards which one you would like to contribute. DonorsChoose.org describe themselves as "an online charity that makes it easy for anyone to help students in need." On the site, "public school teachers from every corner of America post classroom project requests [...], and you can give any amount to the project that most inspires you. When a project reaches its funding goal, [DonorsChoose.org] ships the materials to the school. You'll get photos of the project taking place, a letter from the teacher, and insight into how every dollar was spent. Give over $50 and you'll also receive hand-written thank-yous from the students." The options are out there -- and I bet there are still others -- and will be up to you to choose which ones would be best for you to try. I have used Freecyle and have been to our local RRFM. I sometimes donate directly to our local Goodwill, which could also be part of the above list. Where can CFL be Taken to be Recycled? 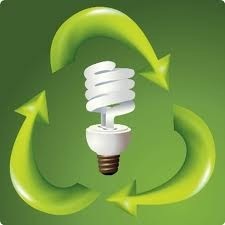 An environmental-conscious friend of mine asked me where she could recycle her burned-out CFL bulbs. I found out that in Brevard County, we can take them to the landfill location that accepts hazardous waste at 2250 Adamson Road - Cocoa, FL 32926 - (321) 635-7954 or call Waste Management at 636-6894 or 723-4455 to order a FREE "Vapor Lok" bag (http://www.brevardcounty.us/SolidWaste/RecyclingInformation) that takes five days to be delivered. Once WM drops off the bag, you keep it until is full. Once it is full, you should call the same numbers for the bag to be picked up, also within five days. Other alternatives listed at http://search.earth911.com, site of Earth911, Inc., "a for-profit wholly owned subsidiary of Infinity Resources Holdings Corporation that specializes in providing consumers with accessible and actionable recycling information across the country," were: Batteries Plus, Lowes, and Home Depot. I called Lowes in Rockledge, (321) 631-0696, and they informed me that they always have a bin by Customer Services where fluorescent light bulbs, including CFLs, can be dropped off and they will take care of properly disposing of them. Next time your bulb burns out, you now have an idea about where to go or where to look for places to drop them off. If you can't find a place to recycle your CFLs, EPA recommends to check "if your state or local environmental regulatory agency permits you to put used or broken CFLs in the regular household trash, [and if they do,] seal the bulb in a plastic bag and put it into the outside trash for the next normal trash collection." Recycle Brevard was invited by Space Coast Early Intervention Center to participate in the Autism Awareness Festival this year and do a demonstration on recycling. Set up started at 9am. We had informational material for the table, a craft (weaving plastic bottles,) and a game (bottle-cap tossing) for the kids to have fun while learning about reusing and recycling. It was very windy and our poster board (made out of a cardboard box) was hard to stand on the table. The festival was from 10am to 2pm and a lot of families passed by. Cyclists also came by after cycling in the Cycle Jam cycling event that was also held at Florida Institute of Technology (FIT.) Both events were to benefit SCEIC. At the table we collected a lot of recyclables, mainly cans and bottles. That was another opportunity to educate residents since some tried to place plastic cups, paper cups, straws, and napkins in the bin. 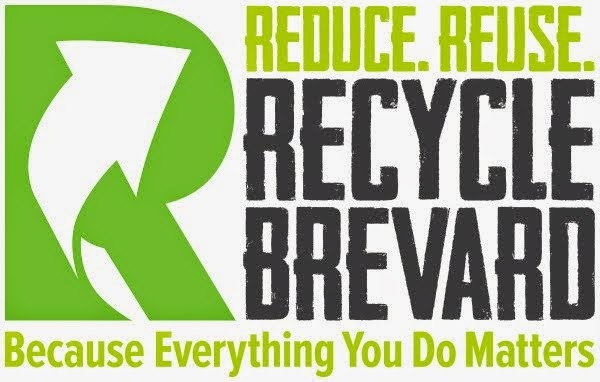 Another chance to go over what can be recycled in Brevard County. We were also making pinch bowls out of plastic bottles and ribbons. That was a good activity for the children to work on their fine motor skills. Student volunteers helped with that (and also with holding the poster boards on the table...) One boy did the craft and then placed it in the recycle bin -- that's right; that is where plastic bottles should go! But I rescued that one out of the bin. A parent volunteer came to help and she took the bottle-cap-tossing game to the grassy area next to the bounce house and crafts tent. All children got stickers for trying and they celebrated the caps they tossed into the half-bottles affixed to the board. A simple game that made a lot of them smile. At 11am was the demonstration. A few kids gathered around to listen to a story (Why should I recycle? by Jen Green) and help separating the garbage into recyclables and trash. It was the first time we did an activity like that, but I am sure it will not be the last. Towards the end of the day Easter Seals Florida, Debbie Danner, approached me with the idea of having a presentation at their facility to bring information and activities to the adults who utilize their vocational services in Palm Bay. Let's see how things develop and maybe we can create a program for them. For many reasons, it was a very good day and the rain came down just at the right time: right after the event was over and most tables were put away. We do not get that lucky every day! Make this day a day to start changing habits, adding positive changes to your routines. 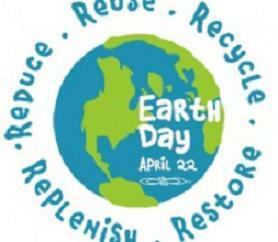 Participate in a local event, plant a tree, go on a bike ride, pick up trash you find on the beach, volunteer with Keep Brevard Beautiful, go for a picnic, take a reusable bag to the supermarket, get children involved, visit a park with your family, do a green project at home, recycle more, reuse even more! All of it counts, whatever you are willing to do makes a difference. And today is a good day to start. Judith Mayer, a fellow member of Keep Brevard Beautiful Central Chapter, one day called me to share that she had found a company in Cocoa that was willing to donate its production scraps and rejects as long as the material was picked up at their facility. The company is Elastec/American Marine and the material is styrofoam (different shapes and kinds) and rope, in other words, non-recyclable materials. I contacted Viera High School Art teacher Susan West and Manatee Elementary Art teacher Ashley Heribacka. They both showed interest in receiving the material to use in their classes. Last Thursday, April 12th, I followed Judith to Elastec and picked up fours big bags of styrofoam and two piles of rope that filled up my car. Two bags of foam got delivered to Manatee on Friday and the rest will be going to Viera High this week. I sent an email to Brevard's Reuse Center (Reusable Resources Adventure Center - RRAC) to see if they would be interested in collecting the scraps/rejects too. There is so much of the rejects that we could avoid adding to our landfills and so many other teachers that could benefit from using them in their classes that would be a shame if they do not get re-purposed through a channel like RRAC. It will not be the end of styrofoam in our landfills, but it is a step forward for our local community: we avoid more scraps/rejects being sent out to the landfill, and help public schools get free material for their classes. I just came back from a trip to Brazil and, without any research or looking into it, my impression as a visitor is that there is a lot to be done there in regards to recycling. I visited a few cities in the state of Rio de Janeiro and Sao Paulo. In Rio, small towns and the capital city alike, there were practically no indication that they recycle at all or that the local residents and government are making an effort for that to happen. There were no visible recycle bins on the streets, no sign at restaurants, no messages being conveyed on TV or street signs or billboards. There was basically nothing. The only thing I saw, but am not sure how well it is used, was a specific bin to throw away coconuts -- a very popular fruit for its delicious water and found when walking around the lagoon and the beaches. I was really surprised that there is no more being done. Rio de Janeiro is the capital all tourists want to visit, the one deeply connected with nature and natural resources. It is amazing how little it seems it is being done there. Next, I went to Sao Paulo. At least there I could feel and see an effort being m ade toward recycling. I saw a few places with recycle bins on the streets, the hotel had recycle bins in the kitchen and used recycled paper in the toiletries available for guests, and plastic bags were banned from supermarkets just last Wednesday, April 4 (I saw on the local news). This is a huge step forward. I just have an issue with charging for the biodegradable bags. Those bags should be the ones offered to consumers to begin with, and since supermarkets will save tons by not providing regular plastic bags and will be selling reusable bags, they should simply replace plastic bags with biodegradable bags and offer them at no cost to their customers. But, still, replacing the bags is a step forward and maybe charging for the bags will push more customers to bring their own reusable ones, and that is also positive. So, when comparing the two states looking at them through a tourist's eye, Sao Paulo seems to be way ahead of Rio from a recycling perspective. I hope that that is just the beginning of a new trend and Rio will try to catch up with that soon. Good reasons exist and if being the right thing to do for all is not enough of a reason, maybe the survival of the natural beauty Rio is famous for could be.